We might not be sold on the audio properties of brass in this small a size, but Master & Dynamic ME05 are definitely a very nice sounding pair of in-ears. We might not be sold on the audio properties of brass in this small a size, but this is definitely a very nice sounding pair of in-ears. If the name Master & Dynamic name doesn’t ring a bell, it’s because the company hasn’t been around that long. That said, it is already making big waves. This is partly because a few of the company’s products have been well received, but it owes a great deal to the bold design decisions behind those products as well. Case in point: The Master & Dynamic ME05 in-ears. They’ll catch your eye almost immediately since they’re milled from solid brass, but the reason behind this actually has to do with the earphones’ sound. There’s a reason that instruments like trumpets are made from brass, and while we remain dubious about the effect that the material has on the ME05’s sound, we had to take a look at these ourselves. Open up the box and you’ll find a smaller circular leather box that holds the headphones. Next to this box you’ll find a microfiber cleaning cloth and clothing clip. Take the headphones out of the smaller box and you’ll find a canvas carrying pouch and the manual. Because of the brass construction, you’ll only find one color option here, but to cover up the finish would be missing the point of the ME05s. Master & Dynamic isn’t the only company to use brass for its in-ears, but this certainly isn’t common, and whether or not there are acoustic benefits, the ME05s certainly leave an impression. When you first pick up the ME05s you’ll notice that they’re fairly heavy, to the point that it doesn’t seem possible that they could be comfortable. Surprisingly, that weight seems to disappear as soon as you place them in your ears. They might not be the lightest-feeling in-ears we’ve ever tested, but I was surprised at how comfortable these were. I expected the ME05s to constantly be falling out of my ears, but this didn’t prove to be a problem. If it happens to be a problem for you, try changing your tip size. Four different sizes are included in the box, but if none of these work for you, it may be worth looking into third-party tips. Despite the seemingly heavy-duty build, Master & Dynamic warns against exposing the ME05s to water or dust in the manual. Two filters similar to those packaged with RHA’s T10 and T20 are included, but don’t expect these to change the sound – they’re simply replacements in case you damage one while cleaning the ME05s. If you encounter a more serious issue with these, Master & Dynamic provides a two-year limited warranty. This is a standard wired pair of earbuds, so your only connectivity comes in the form of a 1.2-meter cable, though it is flat and tangle-resistant. An iOS-compatible mic and remote are included, though Master & Dynamic has made an interesting change: The mic is separated from the controls for increased vocal clarity. Sure enough, we found that call quality was above average when using the ME05s. While in-ears are generally meant more for use with mobile devices, we still tested with both an iPhone 6 playing Spotify streams on the Extreme quality section and by playing lossless files from a computer through a Focusrite Saffire Pro 40 interface. There was obviously slightly more apparent detail with higher quality source material, but the phone had no problem driving the ME05s and both sounded very similar in general. Given the brass construction, I wasn’t sure how the bass would hold up, but even on songs that aren’t particularly bass-heavy like Big Surr’s “Cosine + Tangent,” the low end looms large. This doesn’t mean the lows are going to blast your brain out of your skull – if you’re looking for the bass to rule over all the other frequencies, look elsewhere. Bass response is quick with good definition, and you won’t find the low end bleeding into the mids. During testing I found the ME05s could sound harsh on some recordings (Rozwell Kid’s “Baby’s First Sideburns,” for example) but this seemed limited to a few select songs. For the most part, the highs are mellow in the best sense of the word – they don’t skimp on detail, but they aren’t assaulting your eardrums either. Even on older recordings, ride cymbal bells and hats that are often buried translated well. Sleep’s “Dopesmoker” makes for a great test song because it can turn into absolute mud on lesser in-ears, but that didn’t happen here. The bass, drums, and guitar were still the cohesive blob they are, but that’s the song: The point is it was a “good” kind of cohesive blob. Soundstage is good – among the best we’ve seen in earphones in this price range – and spatial cues are given plenty of room. Isolation works fairly well too. It’s not going to block out everything around you, but office chatter or the noise during a commute should stay in the background. The ME05s are way more comfortable than anything made out of solid brass has any right to be, and while we’re still not sold on the effect of the material on the sound signature, there is no denying that this is a very nice sounding pair of in-ears. The style likely won’t be for everyone, but if you’re a fan of the look, these are worthy of your consideration. The price is likely to be a sticking point for some, and with good reason. 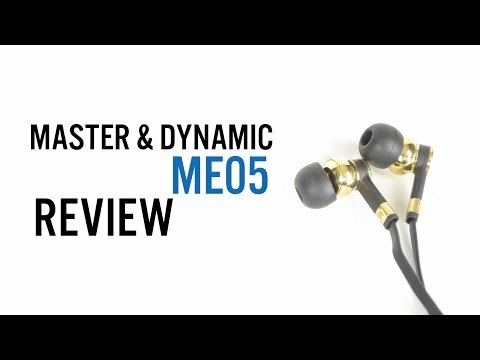 While the ME05s certainly have a premium build and design, if you’re looking for the same sound quality without the gloss, you’ll find cheaper options that will make your ears just as happy.